My Screen Recorder Pro : What are Folder Shortcuts? All the media files are organized in folders. When the application is launched, a folder with the name "My Recordings" is created in "My Documents". 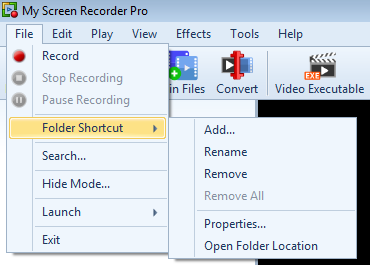 When you create a screen recording, by default it is saved in the "My Recordings" folder. 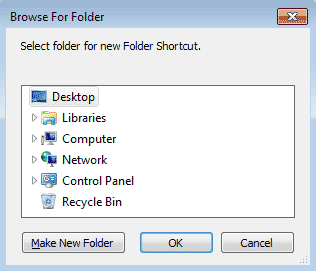 You can create a folder shortcut to any folder that is present on your PC. To create a new folder shortcut, click File >> Folder Shortcut >> Add. Select a folder from your PC. Note: You may also create a folder shortcut by dragging and dropping it in the folder shortcut list view. If necessary, you can change the name and location of the folder. Select the folder, click File >> Folder Shortcut >> Properties. Click Browse to change the location. To rename a folder if necessary, click File >> Folder Shortcut >> Rename. Note: If a folder is renamed, its name in the File List changes. The actual folder on your PC is not renamed. To delete a folder, select it, and click File >> Folder Shortcut >> Remove. To remove all the newly created folders from the list, right-click the Folder Shortcuts and select the Remove All option. However, the “My Recordings" folder is not removed from the list. Note: If a folder is removed, its entry from the File List is removed. The actual folder on your PC and its contents are not deleted.